As the earth's population swells to 7 billion, the migration to cities accelerates, incomes rise, and people desire things the things that improve their lives, thus increasing global demand for commodities and natural resources. A larger, wealthier class of people in the emerging world are demanding more goods as they raise their standard of living and the supply of these goods is impacted by geopolitics, diminishing mature sources and even weather. The story begins in emerging markets where economies are growing at stable, healthy rates. Current growth rates for countries such as China, India, Malaysia and others are in the 6-10 percent range, manageable levels that are not characteristic of overheating economies. Many forecasters are expecting a slight slowdown in growth for emerging countries but a few (South Africa, Indonesia and Russia) should see GDP growth rates surpass last year's levels. Many point to China's bank lending, which was roughly $1.2 trillion last year, as a negative because it is such a large amount for a $5 trillion economy, but we don't see it that way. We think what's taking place is more of a normalization of liquidity and interest rates. Growth will still be in the upper single digits, which is very constructive for commodity demand going forward. Economic growth is just the tip of the iceberg. 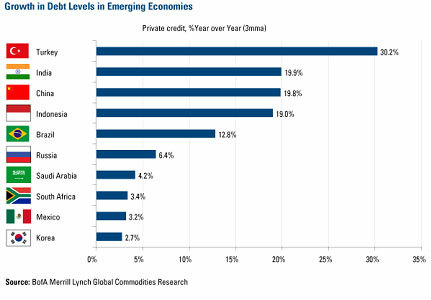 Many of these emerging markets are just discovering credit. India, China, Brazil and Russia all have consumer debt levels growth below 20 percent. Other burgeoning countries like Saudi Arabia and South Africa have less than 5 percent. As credit expands to this hungry consumer base, the consumption of refrigerators, furniture, air conditioners and other luxuries we consider necessities here in the U.S. should follow suit. We've already seen the impact rising income levels can have on consumption in Chinese car sales. From 2003 to 2010, China's car sales have increased over 300 percent. In fact, car sales jumped 45 percent last year alone in China. This increase has made China the global leader in car sales. China isn't alone however, estimates show that 72 million cars were produced globally last year and expectations are that it will jump to 79 million in 2011. This auto boom has shifted the dynamics of energy consumption in the developing world. The transportation sector has historically consumed about 35 percent of all energy used in the developing world. But over the next 15 years or so, it's expected to reach about 60 percent-comparable levels to that of the developed countries of North America and Western Europe. Emerging market demand is largely the reason global oil demand levels are at record highs despite a sluggish economic recovery in the U.S. and Western Europe. Much of this demand comes from China and India, whose combined share of global oil demand has increased from 9 percent in 2002 to roughly 15 percent last year. 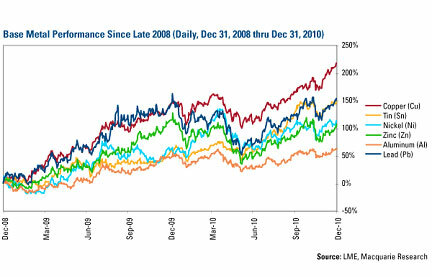 But it's not just oil emerging markets have been gobbling up. It takes a lot of base metals such as copper, tin, nickel and others to expand a nation's power grid, sewer system and transportation lines. China's most recent Five-Year Plan calls for $50 billion to be spent on upgrading the country's power grid and an another $110 billion on building 13,000 kilometers of high-speed railways. This is a reason why we've seen the price of copper, lead, tin, nickel and zinc jump more than 100 percent during the past two years. The market isn't expecting prices for these metals to turn around any time soon. Take copper for example. Current prices are north of $4 a pound but the futures market remains bullish with prices set around $5.43 a pound. Copper's supply/demand fundamentals are very supportive of higher prices. Mine production has been declining since the early 1990s but the metal's versatility has kept copper demand on the rise. For instance, you may not think that air conditioning demand would have much to do with copper prices but each central air conditioning unit contains roughly 50 pounds of copper. 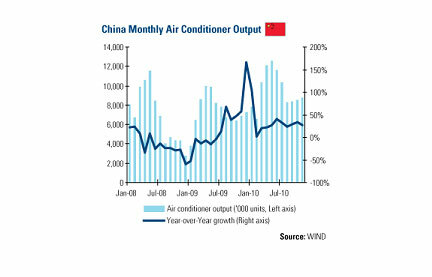 The monthly output of air conditioners in China has increased since the beginning of 2009, coinciding with a 217 percent increase in copper prices. Copper isn't alone. We're bullish on many industrial commodities for similar reasons. As the rebound in global economic growth continues, we should see increased demand for other commodities like metallurgical coal, which is used to make steel. The biggest threat to commodity prices is the possibility that the Federal Reserve may begin to raise interest rates, which would weigh on commodity prices. More than likely however, the Federal Reserve will maintain historically low interest rates and the U.S. economic recovery will remain on course through the year. To listen to the full outlook from the Global Resources Fund team, listen to the Outlook for Natural Resources webcast on demand. Please consider carefully the fund�s investment objectives, risks, charges and expenses. For this and other important information, obtain a fund prospectus by visiting www.usfunds.com or by calling 1-800-US-FUNDS (1-800-873-8637). Read it carefully before investing. Distributed by U.S. Global Brokerage, Inc.
All opinions expressed and data provided are subject to change without notice. Some of these opinions may not be appropriate to every investor. Foreign and emerging market investing involves special risks such as currency fluctuation and less public disclosure, as well as economic and political risk. Because the Global Resources Fund concentrates its investments in a specific industry, the fund may be subject to greater risks and fluctuations than a portfolio representing a broader range of industries.